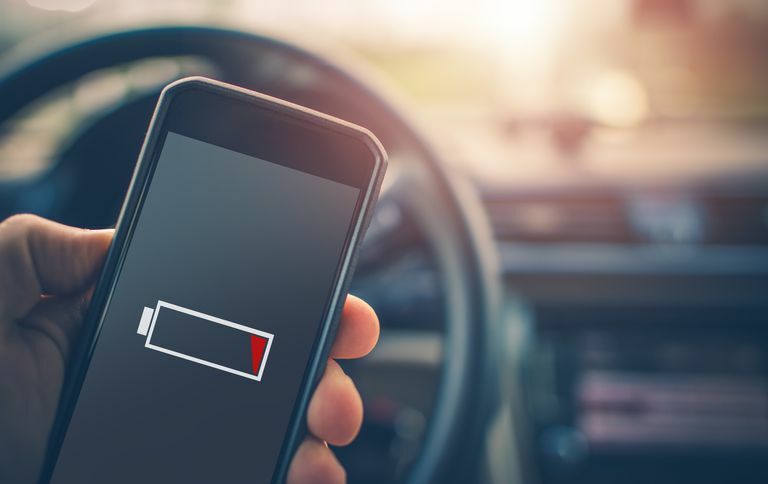 If your iPhone won’t charge or can only charge when plugged into a specific charging cable, car charger, or an external charging brick, you might be able to resolve the problem by cleaning the charging port. There are several ways to do this. You can have the lightning port cleaned by a professional; that’s the safest option. If you want to do it yourself though, you can use canned air and/or a mini vac, a Post-It Note, a toothpick, or some combination of these. What Clogs a Charging Port? Because the charging port is located at the bottom of the iPhone and is open to the elements, it can collect lint, dirt, and other debris from just about anywhere, including a purse or shirt pocket. It can get dirty from sitting on a picnic table in the park on a windy day. It can get clogged with dust from your home. There are a thousand things that could gunk it up. If you could look inside a clogged port you’d see a wall of debris. This debris, no matter what it is, collects on the pins inside the iPhone port. It’s those pins that make the connection to the charging cable. If there’s not a good connection, the phone won’t charge. Cleaning out this port will release that debris and allow you to charge the phone again. The safest way to clean your iPhone’s charging port is to take it to a professional. They have the tools and know-how to clean your port without harming it. Most likely they won’t stick a paperclip or toothpick in there either (a popular option among do-it-yourselfers), but instead use a small amount of canned air, a tiny vacuum, or another professional cleaning tool to remove the debris gently. If you don’t have access to a professional, you might be able to do the job yourself using canned or compressed air. Apple says not to use compressed air, so you’ll have to make a judgment call here. We've heard it works just fine. However, you need to make sure you only spray a little air at a time, be patient, and whatever you do, do not empty the entire can of air into the port or you might damage it. You can also use a hand-held vacuum like a mini vac or an old-fashioned dust buster. It might be possible to draw the lint out by positioning the vacuum next to the charging port if the debris is already loose. Purchase a can of air that comes with a small straw that can attach to the nozzle (as shown in the image above). Connect the straw to the can, and then position the straw on one end of the charging port. Blow a few very short blasts into the charging port. Each blast should be no more than a second or two each. If you have one, use the mini vac to draw out any loose particles. Repeat a few times, and then test the port. If the phone starts to charge, you’re finished. Note: If you feel you’ve loosened some of the debris but can’t get it out with a vacuum, consider a Post-It Note. Cut the note in strips, with each strip less wide than the port itself. Use the small sticky-side corner to reach in and connect with the loose debris and remove it. This might be the most popular method around to clean an iPhone charging port, but it should only be used as a last resort. That’s because the charging port contains sets of pins, and those pins are fragile. If you stick a toothpick (or paperclip or thumbtack) into this port you could damage those pins. Once they are damaged there’s no option but to have the port replaced. Hold your phone with one hand and the toothpick in another. Gently insert the toothpick into the port. Move the toothpick around, imagining that there is a line of debris sitting on top of a set of very delicate pins. Gently blow dry breath into the port, and try to blow out the debris. Repeat as needed, testing the port in between tries. You’ll know you’ve resolved the problem when the phone begins to charge.